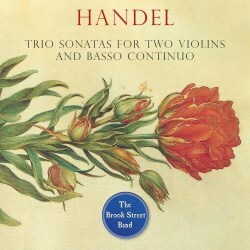 The Brook Street Band have previously recorded the two sets of Trios Sonatas which Handel published in his lifetime (opp. 2 and 5 - review). On this disc they turn to a handful of miscellaneous works which are fascinating both for the musical enjoyment they afford and the contexts in which they stand in Handel’s life and work. As carefully documented in the informative liner notes by the group’s cellist, Tatty Theo, the selection here originates from various periods of the composer’s career, including its earliest stage. Handelians will recognise some of the material that was mined by later for other compositions – the example that audiences more widely are likely to recognise is the opening of the early Sonata or Sinfonia in B flat HWV339 (c.1704-6) which relates to a part of the same keyboard suite which Brahms used for his ‘Handel’ Variations. The Sonatas are played with delightful ease and elegance, serving the dictates of the music itself rather than any particular ideas of the performers’ own which they may harbour or want to press. Their tempos are judicious such that the potentially perilous fast runs and halting repeated figure in the final Allegro of HWV392 are finely turned and the joyous syncopations of HWV394’s second movement bound along. The expressive effect of the Adagio from HWV392 is subtly emphasised by the subtle use of rubato, and the quintessentially Handelian melodic twists and chromaticisms of the first movement of HWV386a in C minor are rightly brought out, but not exaggerated. The violinists avoid vibrato in their performances such that sometimes the sound may sound somewhat thin, but somehow they do capture a more glistening and regal tone in the two Sonatas, HWV50a and 403, which relate to the overtures of the oratorios Esther and Saul. The only other criticism one may level is that in an otherwise finely balanced recording, it does not always reveal much spatial differentiation between the two violins as they pass melodies or motifs to each other. However, at other times this works to the music’s advantage in occasioning a lovely integration of texture, such as in the Adagio of HWV339 where their sighing suspensions are brought into exquisite focus. In all other respects, this is an exemplary recording where Handel’s inexhaustible inventiveness, even on a smaller, intimate scale, spring wonderfully into life.